NYE I LEDELSEN: Eirill K. Holtvedt og Per Kristian Mengshoel. NEW IN MANAGEMENT: Eirill K. Holtvedt and Per Kristian Mengshoel. Norsk Tipping has employed two new directors. 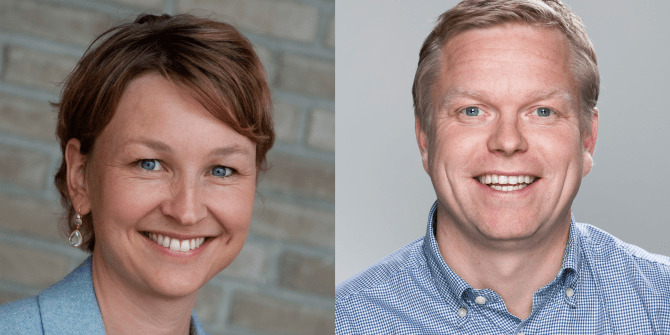 Eirill K. Holtvedt becomes Director of Strategy and Organizational Development, while Per Kristian Mengshoel is responsible for Innovation and Development. Norsk Tipping has for some time been actively working on developing the organization. The process is in the final phase, and we are pleased to welcome two new directors. Eirill (44) is from DNB, where she has been for 19 years. She is a graduate of MBA in Strategy and Finance from BI and Siv. ing. Industrial Mathematics from NTNU. Over the last ten years, she has held executive positions in three different divisions in DNB: Division of Marketing and Communications, then Wealth Management and now New Business. She has extensive experience as both project manager and line leader in merger and conversion processes, group and regional strategy work, brand building, concept development and establishment of new units. Erill lives at Bekkelaget in Oslo, is married and has two children. "It will be very strange to end in DNB after 19 years, but I'm very excited to start in Norsk Tipping. It's never easy to change jobs, but sometimes you have to be courageous and jump on a chance that may not happen again. Norsk Tipping sounds like an amazingly exciting workplace, and as an active athlete, I see daily what the profit of Norsk Tipping is for children and young people's leisure activities, says Eirill. "I'm incredibly happy and big that we have got Eirill on the team in Norsk Tipping. She has the expertise and experience we need in the future, and qualities that complement the top management team, "adm. Dir. Åsne Havnelid. Per (44) studied for civil engineer / master in computer science at INSA Institute of Engineering in Toulouse, France. Then he graduated in technology management in 2008/09. He has worked several years in Norsk Tipping and knows the company well. After completing his studies, he joined the consultancy industry in Oslo with SW development, first in Oracle, then in BEKK. After almost 15 years as a consultant, he started as an intermediary in IT Operations in Norsk Tipping. After three years as an intermediary, he started as a business developer in the New Business unit, where he worked for just over a year. Recently he has worked as Fagsjef Data. In the organization project he has been responsible for building the Innovation and Development department. "That I now get the opportunity to continue this work and lead the Innovation and Development department onwards is something I'm looking at as a real challenge. I'm looking forward to taking on the task, "he says. Per is married, has four children and lives on Hamar. - Per has an exciting expertise and experience from several environments in addition to Norsk Tipping. I'm particularly pleased that we could find such a skilled and good candidate in our own ranks, and look forward to working on Per. He will be an important contribution to the Top Leader Group, "said Havnelid.